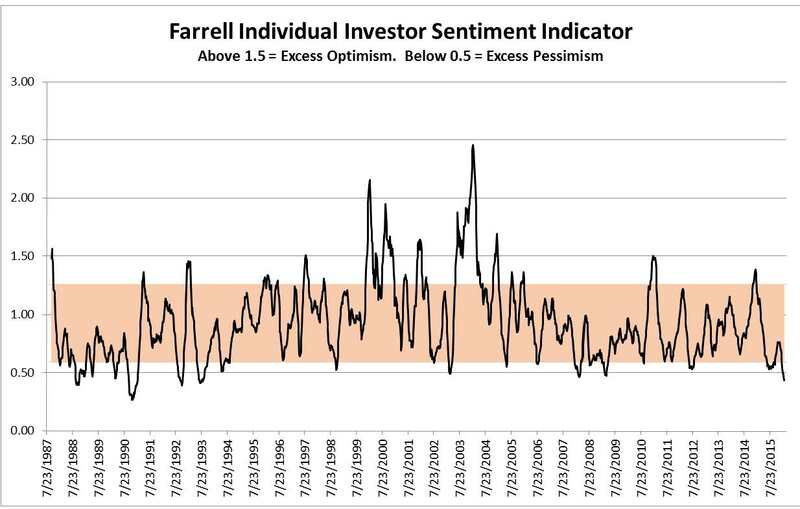 If you’ve read some of our market sentiment level posts in the past, you know we like to follow an indicator based upon the AAII bull/bear numbers called the Farrell Individual Investor Sentiment Indicator. The indicator uses a formula for each week’s release to calculate a weighting between the bull, bear and neutral sentiment numbers, then takes the trailing 10-week moving average to capture the general trend in market sentiment. Generally, 10-week moving average numbers above 1.50 indicate excessive bullishness, while numbers below 0.50 indicate excessive pessimism. Since our data started in late 1987, there haven’t been many weeks or periods with numbers from the Farrell indicator coming in below 0.50. Out of 1,479 weeks/datapoints, only 75 have come in below that level, or approximately 5%. Four of those 75 have occurred in the last four weeks straight, the first time the indicator has fallen below the 0.50 level since the very bottom of the financial crisis during the first two weeks of March 2009. 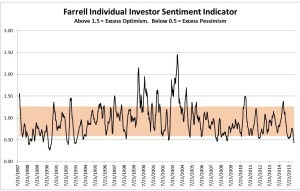 In other words, individual investor sentiment has reached rarely achieved pessimism levels, interesting in our opinion because the scope of the recent correction hasn’t even matched the levels of the 2011 correction, much less the dark days of the 2008-2009 meltdown. 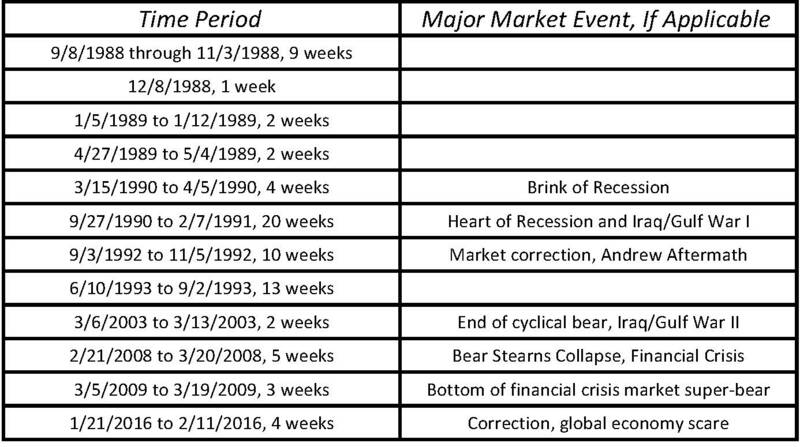 What happened in terms of market performance for the year following each of the periods listed above (except for the current period of course, which remains TBD)? The subsequent market performance was outstanding. For the 71 occurrences before the current period, average one year forward market performance, including dividends, was 17.33%. Median performance was 18.97%. 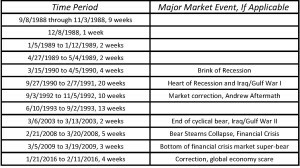 Only 5 weeks out of the 71 produced negative one-year-forward performance: the five consecutive weeks from February to March 2008 as the financial crisis and recession accelerated. One-year-forward performance for those five weeks ranged from approximately -40% to -46%. This period was perhaps unique in that it represented the beginning stages of the worst recession since the Great Depression. At that point, LEIs had clearly foreshadowed the possibility of recession over one-year-prior, market technicals were terrible, and several major financial institutions had already fallen as the housing crisis picked up. Otherwise, extreme pessimism periods, which have usually occurred during simple corrections, periods with severe headline risk but no recession (think Iraq War I or Savings & Loan Crisis), or near the end of NBER-declared recession periods, have produced outsized returns. Excluding the early 2008 period, average one-year-forward returns jump to 21.88%, with a median of 21.77%. Will we see a repeat of the typical sub-0.50 return stream? Perhaps. At this point, market and economic structure, more closely resemble the typical periods of market indigestion, not the early-2008 period. Currently, our economic index incorporating various LEIs shows no sign that we’re currently embroiled in a global recession. Even with the recent problems in high-yield bonds and some other corners of the financial universe, our indices of US and European financial stress are still below long-term historical averages. And, while slightly elevated in the US, overall equity market valuation levels for developed and emerging country indices around the globe are far lower than observed in late 2007 and early 2008. There aren’t any absolutes in the world, but there’s nothing we see right now that causes us major concern that this is a repeat of a 2008/2009 or 2001/2002 or 1973/1974 type scenario and not a run-of-the-mill, but still painful, market correction. If past precedent holds up when it comes to extremely pessimistic individual investors, we may be due for solid returns over the next year+.